You can collaborate on the entire project (advised) or just on the lexicon (LIFT – for use with other programs). The Send/Receive Lexicon option is designed for collaborating with team members who use WeSay. Using the Send/Receive Lexicon option for sharing lexical data between FLEx users when there are no WeSay users in the team is not recommended. FLEx users should use Send/Receive Project to share the full data set, rather than using the more limited Send/Receive Lexicon, which is limited to what is covered by the LIFT format. You can use both kinds of Send/Receive if you are working in a team which uses both FLEx and WeSay. In this situation, it is recommended to have only one FLEx member use Send/Receive Lexicon, and then use the Send/Receive Project to share that data with the other FLEx team members. Before using Send/Receive Internet using the default server, you need to go to languagedepot.org and create a user account. For each project you want to Send/Receive, you also need to contact admin@languagedepot.org so they can create an online repository for you. They need the name and ISO code of the language plus whether you will be using the option Send/Receive Project (FLEx only) or Lexicon (for use with other programs). Settings button before you can use it, in order to enter the details of the remote server and the project’s repository id, etc. 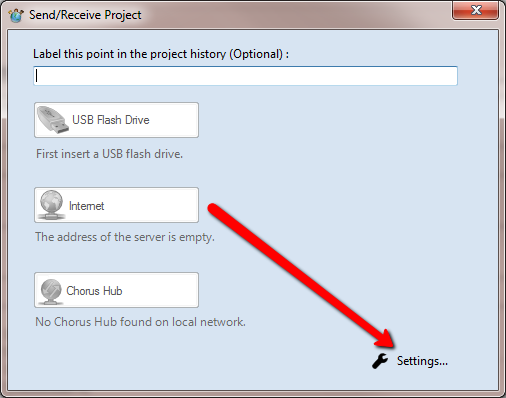 To use Chorus Hub for local area network, one computer on your network needs to start the Chorus Hub program. For more information, look at the document Technical Notes on FieldWorks Send/Receive on this page. You can read more about Chorus Hub on their website. Concept: all start from one copy of the project. Someone sends it. Others receive it. All can then send/receive. What if there were multiple copies of the project already? Can we merge them? No, not automatically. You need to do any importing or exporting you need to do to come up with a master project which is the best version of the project. Delete the now outdated copies of the FieldWorks project from other computers. The person who doesn’t yet have the (master) project uses Get Project from a Colleague on the Welcome dialog or Send/Receive > Get Project from Colleague. This is a one-off step! If you want to join a Lexicon (LIFT) repository from a project you already have in FLEx, use Send/Receive > Get Lexicon and Merge with this Project. This is a one-off step! Once the project has been sent, and each collaborator received it the first time, all collaborators can continue to work together and share data using Send/Receive > Project, or Lexicon. The settings are saved and do not need to be re-entered. There is a toolbar button which will open the Send/Receive dialog to the last type of Send/Receive you did (project or lexicon). The Messages (a.k.a. Conflict Report) will be displayed after Send/Receive if there are new messages to review. You can also open it at any time with Send/Receive > View Project Messages, or View Lexicon Messages, as appropriate. Many merge-related messages are hard to understand. This is probably going to be an ongoing area of improvement, depending on feedback – how problematic the messages are in practice. Send/Receive does a really good job of automatically merging data when users have changed different parts of the project. When two people have edited the same or very closely related data in the same sync cycle, send/receive keeps the data entered by the current user. A conflict message is generated and includes information of the other user’s change for comparison. If you prefer the other user’s change, you will need to copy and paste the data manually into the appropriate place in FLEx; there is not yet a tool to select one change over another and have the FLEx project automatically updated. If one user adds word glosses to a text at the same time as another user adds word categories to it, this will not be merged conveniently because in the FLEx database these separate pieces of data are both part of a word’s analysis. If one user modifies an entry, sense, etc. at the same time as another user deletes that same item, send/receive will keep the modification rather than the deletion. If a team needs to use the global change tools in FLEx, such as Bulk Edit, merge conflicts will be reduced if the team first does a series of Send/Receives to get all sync’ed to the same state. Then one user can do the global changes, and the team then re-syncs to get those changes and continue on with their tasks. Send/Receive is possible because of a piece of add-in software called FLEx Bridge. It cannot be used outside of FLEx. Look at its webpage for more information.